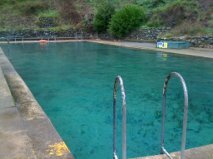 Recently we visited the Yarrongobilly Caves and Thermal Pool in the Kosciuszko National Park in NSW with our niece, S. It was only six degrees Celsius the day we visited, perfect weather to have a swim in the 27 degrees Celsius thermal pool. I didn’t tell S there were frogs in the pool or she probably wouldn’t have hopped in, as she was already uneasy about the slimy moss on the sides of the pool. We changed into our swimmers and then put our coats and hats and shoes back on to scamper down to the pool, wondering if a swim was such a good idea. However, it is a long way to go and not have the experience, so we all swam. Driving to the National Park from Tumut, we saw signs for kangaroos and sure enough, not much further along there were hordes of kangaroos. We pulled over to the side of the road on the way up the mountain to watch two kangaroos fighting. This pair of boxing kangaroos were just as serious as grown men having a disagreement outside a pub and just as ridiculously funny. We also saw signs for emus, wombats and brumbies but despite being on the look out, didn’t see any. We had guided visits to two caves and saw stalagmites and stalagtites (the ‘mites’ go up and the ‘tites’ go down), shawls, flows and formations that had taken millions of years to form. The guides were great, really interesting and informative. You can tell when people really love their work, and the guides at Yarrangobilly fit into that category. We finished our day with a walk along the river and a visit to the South Glory Cave. The South Glory Cave is a self guided tour. This recipe for Peppermint Slice is probably the easiest recipe I’ve ever made. It doesn’t need baking and is ready in about ten minutes. This is the fourth recipe I’ve made from the Magnificently Simple Marvellous Slice Recipes cookbook, and so far I have to say that the book’s title is completely accurate. Crush the biscuits and Peppermints Crisps. 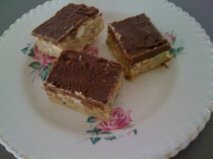 Mix the sweetened condensed milk into the combined biscuits and chocolate bars and press into a lined slice tin. Refrigerate and ice when cool. I iced the slice with 200gm of chocolate melted with 50gm butter, then cut into squares. From Flinders Street Train Station in Melbourne I walk across the Princes Bridge and then down St Kilda Road. I took the picture of the full moon over the Yarra River last week from the Princes Bridge around 6.30am. From the station I walk past Hamer Hall and the Art Centre. The posters advertising coming events change regularly. At the moment the opera ‘Carmen’ is advertised. Will Carmen love Jose tomorrow? Maybe. According to the posters she doesn’t know. The flags with black and white photos of a beautiful woman holding a wild horse are striking. I don’t really remember the storyline, but I don’t think it ends happily. St Kilda Road is covered in autumn leaves. 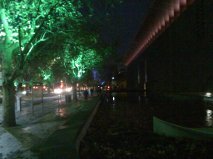 The lights outside the National Gallery shine up eerily into almost bare trees. There are runners and walkers, people walking dogs and people like me making their way to work in the dark. However, suspend your disbelief, because this is a novel. Annajane attends her ex-husband Mason’s wedding, which is the biggest, fanciest wedding of all time. Sure enough, Annajane is sitting in a pew with Mason’s sister when she notices Mason’s jaw twitching as he waits at the altar, a sure sign that he wants to be anywhere else in the world than getting married to Celia, the fiancee his mother loves. Annajane’s impulse is to jump out of her seat and stop the wedding, but when Mason’s daughter Sophie becomes violently ill Annajane doesn’t have to. As the story evolves you learn that Annajane has been working for Quixie, a soft drink company started by Mason’s father. Annajane actually started working for the company as a teenager, and had a memorable stint as the company mascot, “Dixie, the Quixie Pixie.” Her romance with Mason has been on and off again since then too. (If I was giving Annajane advice, I would tell her that an on again, off again romance is probably not going to work out in the long run, but since she is not real I don’t have to worry about interfering in something that is none of my business). The story goes back and forward to tell Annajane and Mason’s back story as their present day romance starts again. The re-kindling of their romance is complicated by all sorts of problems, beginning with Mason’s current bride-to-be Celia, who is very keen to re-schedule her wedding to Mason. Annajane also has an easy going musician groom-to be of her own, who is loving and kind and generous, but somehow, not Mr Right. Then there is Mason’s daughter Sophie, who was born very soon after Mason and Annajane separated (another bad sign for the romance working out you ask? ), and Mason’s mother who blatantly prefers Celia to Annajane. There are loads of other skeletons in the cupboard for Annajane and Mason to deal with too. I don’t think I am giving anything away if I tell you there is a happy ending, because that is exactly what readers want and expect from novels with cheerful cover art and sweet names like ‘Spring Fever’. The enjoyment of reading Spring Fever is in the journey, following the twists and turns to find out how Annajane and Mason overcome the problems that caused them to separate in the first place. I’ll happily read more books by Mary Kay Andrews when I’m in the mood for a happy ending and don’t want my brain to be too taxed getting there. Cream Cheese Slice is the third offering from the Magnificently Simple Marvellous Slice Recipes Cookbook. 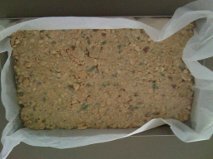 Line a square cake tin with baking paper, then line with nine of the biscuits. Cream the butter and cheese together really well. (Check for lumps. I didn’t, but wish I had). Gradually beat in the sugar, then add the remaining ingredients. Spread over the biscuits, then top with another nine biscuits. Refrigerate, Cut into nine pieces. You should have two biscuits left over, perfect for taste testing the cream cheese mixture before you wash out the bowl. He Who Eats All of Our Leftovers and I visited Bendigo, in central Victoria at the tail end of our holiday between Easter and Anzac Day. 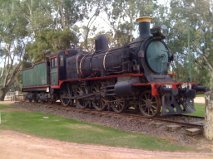 We left Swan Hill in the morning, undecided whether to continue travelling along the Murray River to Echuca or to visit Bendigo. The weather nearly determined our route, because Echuca was expecting a sunny 21 degrees Celsius and Bendigo just 14 degrees. We decided while we were driving that accommodation in Echuca on a long weekend might be unavailable and so went to Bendigo. 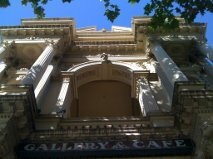 Gold was discovered in the Bendigo area during the 1850’s and the area boomed, becoming a city with ornate public buildings built on a grand scale. The picture below is the Colonial Bank. The roses in the garden surrounding the Conservatory were beautiful. 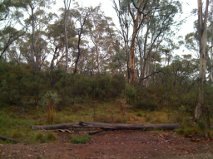 We climbed the Camp Hill, which is part of the park in the middle of town in order to climb the poppet head lookout tower, which has a spectacular view all over the city to the surrounding suburbs and hills. We visited the Art Gallery which has a really, really good display of important Victorian art. The contemporary art was good, but I particularly enjoyed seeing works from the Heidleberg School, who were a group of Australian artists from the 19th century. I ate the nicest bread roll I have ever eaten in Bendigo, from a bakery called The Good Loaf Sourdough Bakery and Cafe. He Who Eats All of Our Leftovers had a milkshake and a cake, but he doesn’t know what he was missing. My bread roll was corn and something, and I have never tasted anything so good. There is a lot more to do in Bendigo, but we ran out of time. 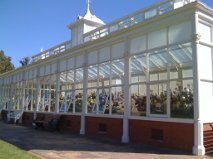 I did manage to have a browse through some op shops, antique shops and second hand bookshops, but next time we visit Bendigo we’ll take a trip on the talking tram, visit the Golden Dragon Museum and the Central Deberoh Gold Mine. I’ll also make a return trip to the Art Gallery and get another sourdough bread roll. I hadn’t looked at Lorraine Elliott’s blog before reading her book, but since I don’t live under a rock, I had already heard of the very popular Australian foodie blog, ‘Not Quite Nigella’. Lorraine is an Australian woman who lives in Sydney, whose parents were from Hong Kong and Singapore. The book consists of stories about Lorraine’s husband, Mr NQN, their friends and family, and the adventures she has as a lover of food and as a very successful blogger. Quite a few chapters end with a recipe, which range from family recipes and comfort foods, to spectacular cakes which would hold their own as a dessert in fancy-pants restaurants. The recipe in the book that most appealed to me was 2000 Feuilles. The combination of puff pastry, hazlenut paste, praline crisp, meringue buttercream, vanilla creme patissiere and praline cream sound absolutely wonderful, although I will never make these for myself because the recipe is just way too much hard work. If I ever get to Paris I will be on the lookout for a Pierre Herme boutique, where I will purchase one of these precious pastries and carry it away with me to laugh and cry over, photograph and eventually gobble up. Lorraine’s stories about her parents are hilarious. I particularly enjoyed a story about her mother, who will share her recipes but leaves out ingredients, in order that her children have to visit to enjoy their favourite meals, since they can’t replicate her recipes. Mr NQN grew up in a vegan family eating mostly raw foods. The stories about his parents are funny too, and I have sympathy for Lorraine trying to prepare a meal for her in-laws who don’t eat meat, seafood, eggs, dairy, bread, wheat or chilli. There wouldn’t be many recipes in my repertoire that would suit Mr NQN’s family. Thank goodness He Who Eats All of Our Leftovers and his family aren’t fussy eaters. For her blog, Lorraine interviewed Nigella Lawson, who Lorraine says greeted her with Eurpoean kisses and said, “Oh, it’s Not Quite Nigella” when they met. It’s probably obvious, but Lorraine says discovering Nigella Lawson’s books started her love for cooking. Lorraine says that when she was interviewing Nigella, inside she was a “river of melted chocolate”. Lorraine visited prisons to blog about the food, volunteers with the Salvos where she cooks desserts for those in need and goes off on adventures across Sydney chasing the perfect Peking Duck. The book finishes with some good advice about how to blog and how not to blog, which ‘Not Quite Nigella’ is perfectly qualified to give. This recipe tastes better than it looks. More importantly, it is easy to make and takes less than half an hour. Coat the chicken pieces in flour, then fry in the butter and oil in a big frypan. Remove the chicken from the pan and cover to keep warm. Cook the bacon and onion in the same frypan to keep the flavour. Once cooked, add the corn and stock. When the sauce thickens a little, return the chicken to the pan to reheat, then serve with green vegies or bread. 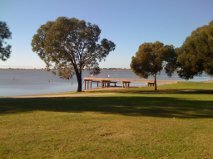 After leaving Narrandera on Easter Monday we drove across the Hay plains to Swan Hill, which is on the Victorian side of the Murray River. The Murray River separates the Australian states of New South Wales and Victoria and runs for 2500 kilometres. 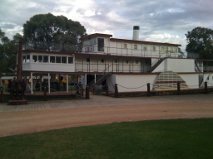 At Swan Hill we took a river cruise on the paddle steamer PS Pyap, to the Murray Downs Station and back. I stood on the deck and had a Sigrid Thornton from the Australian television series, ‘All the River’s Run’ moment. You probably have to be Australian and of a certain age to remember the series, which was based on the book of the same name, by Nancy Cato, but you could liken it to Jack’s “I’m the king of the world,” moment from the movie Titanic. The cruise starts and ends at the Pioneer Settlement (a re-creation of a pioneer port town). The PS Gem, which was the biggest paddle steamer on the Murray in its’ day, is permanently moored at the Pioneer settlement, along with steam engines and other pieces of machinery. I can remember seeing the Gem when I visited Swan Hill on a caravan holiday with Mum, Dad, my brother and sisters nearly forty years ago. Other memorable things I remember from that holiday was my sister E getting car sick before morning tea time on the first day (don’t forget, this trip was back in the bad old days when Dad smoked in the car) and then Dad burning off his eyebrows when he blew up the gas stove lighting it to make a cup of tea for morning tea. Mind you, our first stop was probably only an hour and a half from home. It’s a wonder we didn’t turn around and go home then. My other sister D, who was the baby of the household, had a musical tooting toy, which drove the rest of us crazy for the entire trip, but as Mum said, at least she always knew where D was. We also visited the Lake Boga Observatory one night which I can highly recommend. There is nothing like looking at the night sky to realise just how unimportant we actually are. We were part of a small group visiting that night and we were all able to see some beautiful constellations including The Jewel Box. John and Maryanne were terrific hosts and John also makes and sells glass pieces. I bought this beautiful piece of glass to remember my visit. 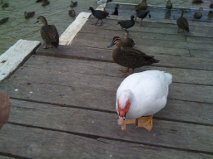 Like most people who walk along the river, we fed the ducks bread from the canoe launching dock. The ducks are so tame they were eating bread straight from He Who Eats All of Our Leftover’s hands. I hope it isn’t another forty years before I visit Swan Hill again.